GRAND RAPIDS, Mich. – To support military heroes and their families and honor those who lost their lives defending our freedoms, the SpartanNash Foundation is launching its third companywide retail fundraising campaign of 2017. All funds raised during the retail scan campaign will be evenly split between Give an Hour™ and Honor and Remember®. SpartanNash and its charitable giving arm, the SpartanNash Foundation, invite store guests to join them in supporting our military servicemembers, veterans and their families through the retail scan campaign, which runs June 28-July 9. During the 12-day scan, store guests who visit any participating SpartanNash-owned retail store or fuel center in nine states will have the opportunity to donate $1, $5 or $10 at any checkout lane. Give an Hour is a nonprofit 501(c)(3) that develops national networks of volunteers to respond to acute needs within our society, beginning with the mental health needs of military servicemembers and their loved ones affected by their time of service. Give an Hour’s network of volunteers includes nearly 7,000 licensed mental health professionals across the nation, encompassing all 50 states, D.C., Puerto Rico and Guam. To date, Give an Hour providers have donated nearly 225,000 hours of free counselling and mental health services to military personnel, their loved ones and hometown communities affected by conflicts abroad. In addition to pledging to “give an hour” of their time each week for direct counselling, Give an Hour’s network of volunteer professionals are working to reduce the culture of mental health by participating in and leading education, training and outreach efforts in schools, communities and military bases so that all in need are able to seek and receive the care they deserve. One hundred percent of donations raised will go directly to the two nonprofit organizations that support military heroes, veterans and those who paid the ultimate price. SpartanNash underwrites the cost of the awareness-building and fundraising campaign as well as contributes funding and encourages associates to volunteer with the Foundation’s grant recipients. For the 2017 patriotic retail scan campaign, fundraising dollars will be evenly split between Give an Hour and Honor and Remember to provide mental health services and support to those serving in the U.S. Armed Forces and our veterans and honor those families whose loved ones have died in service to our country. 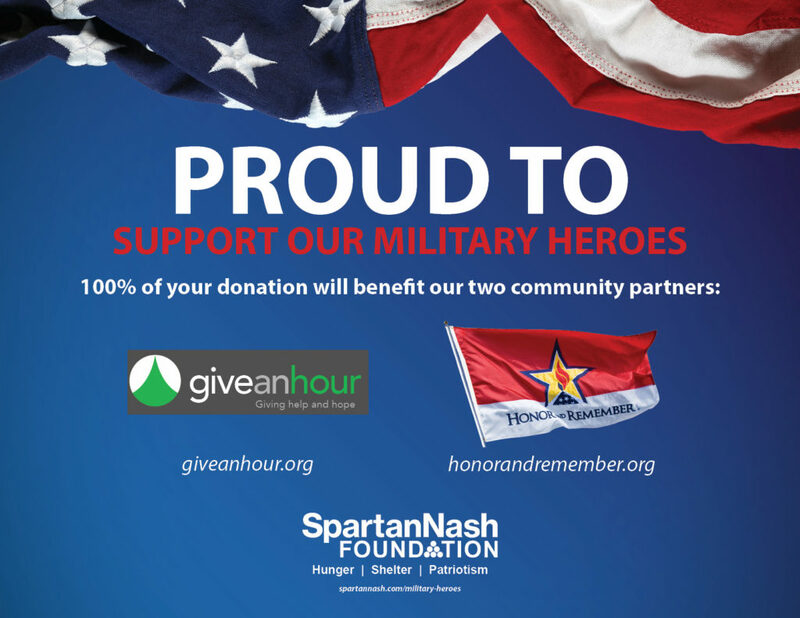 “Each year, SpartanNash contributes thousands of dollars, products and volunteer hours to military and veterans organizations and events, and we are proud to team up with Give an Hour, Honor and Remember and our store guests to support our military heroes in this unique and powerful way,” Gremel said. In 2016, the SpartanNash Foundation launched its first-ever companywide fundraising campaign to support its patriotic nonprofit partners. The scan benefited the company’s national partner Honor and Remember, as well as three regional community partners — Blue Star Mothers of America, Inc., Disabled Veterans National Foundation and Fisher House Foundation. In total, $182,000 was raised to support our military heroes. So far in 2017, the SpartanNash Foundation has executed retail scan campaigns to support local Special Olympics and Habitat for Humanity partners in the communities it serves. To date, nearly $485,000 has been raised through the generosity of its store guests and funds contributed by SpartanNash and the SpartanNash Foundation.